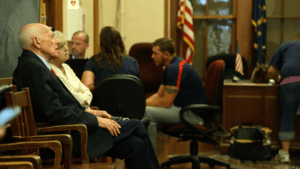 Steve Burger of WNIN public radio of Indiana delved into the background of a psychologist often hired as an expert court witness after the psychologist was convicted of felony charges for falsifying an evaluation in one case. The psychologist, Albert Fink, had performed dozens of competency evaluations over the last 10 years, and those evaluations were now under question after authorities said he confessed to falsifying a report related to a trial at which he was supposed to offer testimony. WNIN’s reporting revealed a system easily abused because it lacks adequate oversight. Courts rely on psychologists to assess the mental fitness of defendants, but serious questions now swirl around how courts determine mental competency in Indiana and what system of oversight is in place to ensure defendants get a valid examination. As part of its ongoing investigation, WNIN uncovered a list of 29 cases in which it is suspected the doctor may have falsified the evaluations. WhenWNIN contacted the chief public defender of the Indiana Supreme Court, officials took the unusual step of actually reaching out to the defendants in those other cases to advise them of their options. In her latest package focusing on recidivism in America for USA Today, FIJ/Schuster Institute diversity fellow Lottie Joiner examines how women are faring in a criminal justice system designed with men in mind. Many of the programs that help inmates re-enter society aren’t appropriate for women, Joiner reports. 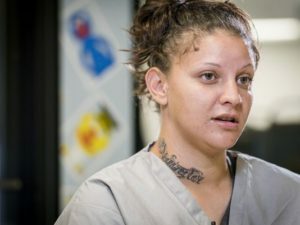 Once an inmate is in the system, it’s hard for her to stay out; in fact, about 70% of female inmates return to the system within five years. Joiner most recent multimedia package focuses on the struggle by one woman to keep herself out of prison for good. Two previous installments began Joiner’s deep dive into re-entry programs, as part of USA Today’s ambitious “Policing the USA” project. Chapter 1 described the recidivism problem in America. Chapter 2 focused on how one woman was seeking to change the system after being caught in the revolving door of the criminal justice system. Chapter 3 looks into the experiences of another woman, who has been in and out of custody since she was 12. The Fund for Investigative Journalism is proud to announce a pair of gifts that will further the work of independent watchdog journalists. An unsolicited $100,000 gift from the Weissman Family Foundation was a very pleasant surprise. A family representative told FIJ that concerns over an “assault on facts” prompted the foundation’s decision to seek out and financially support an investigative journalism nonprofit. Earlier this year, the craigslist Charitable Fund gave FIJ $75,000, the second time the philanthropic organization has donated to our mission. The contributions help FIJ secure additional funds from the Ethics and Excellence in Journalism Foundation, which had vowed to match up to $25,000 of new money raised by FIJ. We hope the generosity will keep flowing as FIJ strives to continue its mission of backing important projects that would otherwise go unreported.